If you’ve been using email marketing tools for a while, you’re probably familiar with autoresponder platforms like AWeber, MailChimp, or GetResponse. While these platforms are efficient in the features they offer , large businesses or companies with highly complex email marketing strategies may find them a bit too simplistic. Customer relationship management (CRM) programs allow multiple departments to share contacts, keep track of the status of the relationship, and make notes about clients or prospects. In larger companies, CRM programs like Microsoft Dynamics or Salesforce may be a useful addition to the company, and these programs usually have some limited functionality regarding autoresponders, scheduled emails, and other email marketing tools. Ontraport is the best of both worlds: a CRM and autoresponder tool, all rolled into one easy-to-use package. Most autoresponder platforms are designed for email marketing rather than customer relationship management. They may be limited in their ability to add things like notes about customers and prospects, which hampers the ability of a sales team to stay updated on prospect changes. Additionally, while most autoresponders give you the ability to filter subscribers into multiple campaigns and tailor the sales message for specific clients, few do it as efficiently and effectively as Ontraport. Let’s take a rather simple example of an Internet marketer. John has designed an informational product: an eight-week course that teaches people to play the guitar. He plans to deliver this course through his email autoresponder. But research shows that a longer email sales series results in higher conversion rates, so John is offering a separate four-week course to teach students to select the right guitar, equipment, and instructors when they’re just starting out. The ideal customer flow is that a new subscriber signs up on his/her landing page to request their four-week “Getting Started” course. At the end of the four weeks of great content, the subscriber is asked to purchase the eight-week “Guitar for Beginners” class. At the end of that eight-week class, the subscriber is offered the opportunity to take private Skype lessons with John. With the best possible customer flow, John is running three separate autoresponders: One for the “Getting Started” course, one for the “Guitar for Beginners” course, and one for his personal coaching clients. But even with this relatively simple customer flow, we can see that if John wants to maximize his conversions, he actually needs more categories. 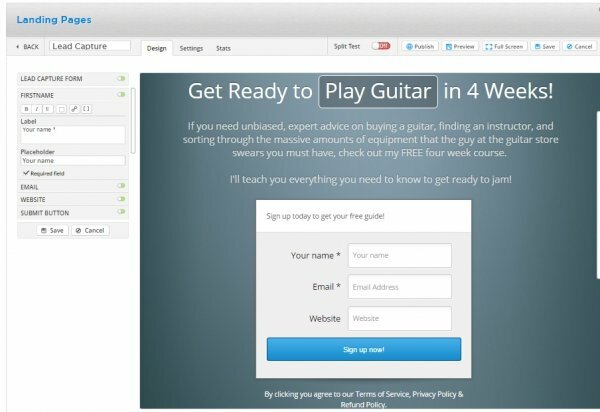 He needs a category for people who did not buy the “Guitar for Beginners” course, and he’s decided to send them an email with some Amazon affiliate links to products and equipment he recommends, followed by a drip marketing campaign to maintain contact with them once the sales series ends. He needs a category for people who purchased the “Guitar for Beginners” course but did not purchase the private coaching, and they’ll move into a drip marketing campaign that’s customized for where they’re at. So John actually needs five separate autoresponder categories. Where Ontraport excels over other autoresponders is the ease with which a subscriber can be automatically moved from one list or group into the next, even with automated rules that require little or no manual customer entry. Like many commercial CRMs, Ontraport allows you to cleanly and easily group, tag, and subdivide subscribers (or prospects or customers) according to specific pre-defined criteria. 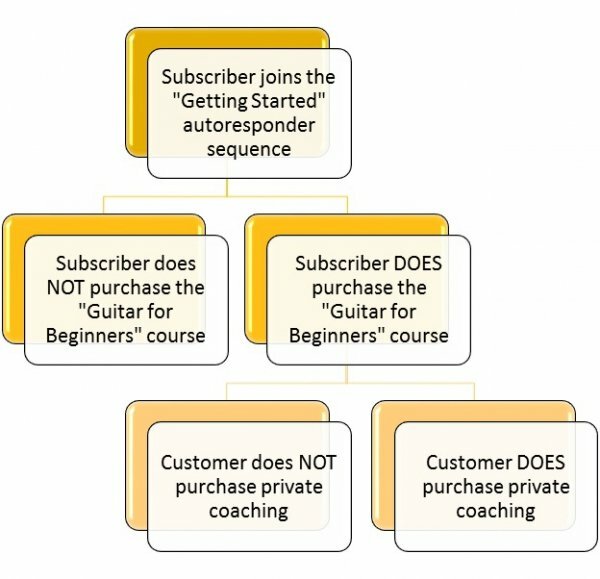 If John gets 1,000 new subscribers a month, 100 sign up for his “Guitar for Beginners” course, and 10 sign up for his private coaching, that’s more than 110 transitions he might struggle to enter with a traditional autoresponder. Ontraport can move his subscribers from one segment to another quickly. Conventional CRMs have two major limitations when it comes to email marketing. First, they can be difficult to use, especially for beginners. CRMs are often designed for corporate clients, not do-it-yourselfers or entrepreneurs, and it’s expected that any employee will have specialized training in that particular CRM. CRMs are also designed for a traditional salesforce, so they sometimes fail to meet the needs of entrepreneurs and marketing departments rather than commissioned salespeople. The second major limitation of conventional CRMs is that they often lack the email features that an autoresponder has. Sending an email series may be difficult, and they almost universally lack the array of templates and scheduling tools available through most autoresponders. After setting up an account with Ontraport, you can use Ontraport’s knowledge base to learn more about how to use specific features. Their comprehensive knowledge base has a variety of tutorials, and they offer a free 2-hour setup consultation with new users to answer any specific questions you may have. To get started, set aside about 30-45 minutes to review the “9 Moves” tutorial located in the knowledge base. Ontraport has a number of useful features that will help Internet marketers stay on top of their email marketing campaigns, but some of our favorites are the automated rules, the autoresponder sequences, and the easy-to-use landing pages. The most beautifully crafted email marketing campaign won’t work if you can’t get subscribers, and most subscribers join your mailing list after responding to a landing page. Ontraport makes it easy to design forms and landing pages, and they even offer free hosting of your landing page, as well as easy integration with your WordPress site. Ontraport uses drag-and-drop WYSIWYG design elements, but the signup forms and landing page templates are easier to customize than with AWeber or MailChimp. AWeber and GetResponse do have more templates available, but they are more difficult to customize than with Ontraport. Before you can design a landing page, you need to build the form to go on the landing page. Look for the “Smart Forms” submenu item beneath the “Contacts” menu item on the left sidebar. The design is drag-and-drop, and you have several options to allow you to customize your form and make it merge with your existing landing page or website design. Once you’ve designed your Smart Form and saved it, you can use the “Landing Page” submenu item beneath the “Sites” menu item on the left sidebar to build a customized landing page to hold your form. Ontrapost allows you to build a lead capture landing page, or to design landing pages that use templates for digital downloads, sales, or for “Thank you” or “Coming soon” pages. Once you’ve selected a template, you can choose from a wide variety of designs and further customize any template to fit perfectly with your needs and your brand image. You can then host the landing page on Ontraport’s own server, integrate it with your WordPress website, or save it to fine tune it later. 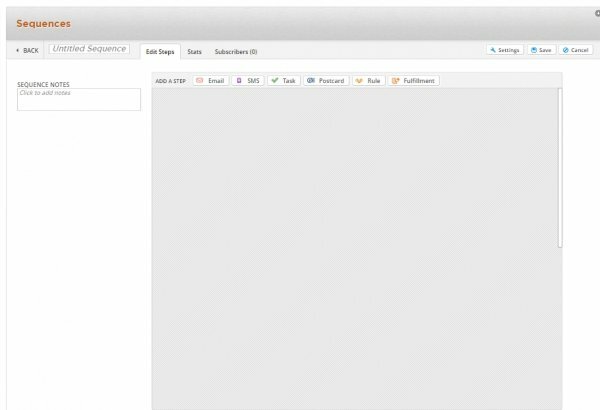 Another great feature of Ontraport is the ability to quickly and easily set up autoresponder sequences. In our previous example, John can set up separate sequences for his Getting Started course and his Guitar for Beginners course, as well as set up different drip marketing lists for his other prospects. 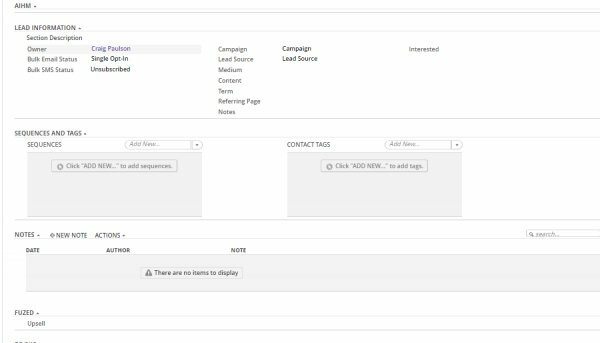 After opening the “Contacts” menu, a button on the top of the screen says, “New Sequence”, and this allows you to create a brand new autoresponder sequence. You may choose to create a sequence based on different steps or based on a date. For example, if you’re putting out a newsletter or a series in anticipation of a new product debut, you want to choose the date sequence to ensure that all of your subscribers get the same message on the same date. If you’re sending out a sales series where emails are sent in a series rather than on a date-based system, you’ll want to use the step sequence. You can add different steps to the sequence, including tasks, rules (which can be used to automatically transfer a subscriber from one list to another), and even emails which allow your customer to purchase products via email. You can add as many steps as you need, and you can ensure that your emails are delivered at the time you select. Rules make it easy to automate list maintenance and to switch subscribers automatically from one list to the next. For example, you can set up a rule that says anybody who doesn’t open your emails for three months will be dropped off your list. You could set a rule to automatically transfer buyers who make a purchase from your “Prospects” list to your “Customers” list. You could even set up a rule to target customers who spend a certain amount of money, or who visit your website a certain amount of time. Ontraport’s rules allow for easy automation, which makes running your business far less time-consuming and ensures that your subscribers receive only the emails intended for them and targeted to their unique characteristics. Many of the features selected for Internet marketing will benefit conventional sales and marketing departments, especially if they do a significant amount of marketing through email. But some features mimic or mirror the features you may be accustomed to with your CRM. For example, tags, groups, and notes allow you to use Ontraport the same way you would use a conventional CRM. Tags and notes allow you to apply specific user-generated criteria to a contact record. Tags provide you with an easy way to search for people within your database, and you can add as many tags as you need to each record. For example, if you meet Susan at the 2015 Industrial Engineers Expo and you learn that she’s the decision-maker for her company, IndustriCo, you might want to tag her with “2015 IEE”, “IndustriCo”, and “DM” (decision maker). When you send out a short “Thanks for stopping by our booth!” email after the expo, you can select only the people with the 2015 IEE tag. If you need to contact someone at IndustriCo, you can search for only people with that tag. And you may want to market differently to decision-makers and influencers. Notes are not really searchable, but they allow you to clearly see relevant information about your customers and prospects. You can track phone calls, important rapport-building information you’ve gleaned, or specific comments or suggestions made by individual prospects. All of this information can be added and edited through the individual contact record form. Groups are a lot like having a saved search in Ontraport. For example, let’s say that Susan has finally decided to bring you on as an exclusive vendor for IndustriCo. After you finalize the deal with Susan, you want to send out a friendly email to all of your influencers at IndustriCo who’ve been trying to bring your company in for years. With Susan’s approval, you also want to send out some periodic emails to your brand ambassadors to keep them updated on the timetable for rolling out your product to the company. Since you know that you’ll be needing to contact this specific group at least a few times, you can set up a group with all the influencers at IndustriCo (using the tags mentioned above). This allows you to send out a broadcast to that entire group of people who meet the criteria you specify. Ontraport isn’t cheap, which may be a turnoff to some entrepreneurs and smaller businesses. Compared to an autoresponder, Ontraport is pricey, but compared to a conventional CRM, Ontraport is a great value. It is more user-friendly than AWeber and MailChimp, but it also requires more work to set things up, as there are fewer templates and pre-designed emails available at Ontraport. Ontraport starts at $297 a month for 2 users and up to 25,000 contacts. If you need a bigger package, the Premium package ($597/month) holds 100,000 contacts and supports 10 users. With either package, you get 2 hours of free onboarding; these are one-on-one sessions with a Client Success Specialist to help you set up your account and get familiarized with the Ontraport platform. If you’re using a WordPress website, Ontraport integrates beautifully into WordPress for you, and the time savings and hassle of trying to make your regular autoresponder or CRM integrate may be cost-prohibitive or simply too time-consuming. However, Ontraport does not integrate directly with most task management programs like Asana, Trello, and Bitrix. Ontraport is a great platform for larger businesses or businesses with a large or diverse marketing funnel. It gives you the best features of your favorite autoresponder along with the best features of an outstanding CRM. I have used them before and while it can be a little confusing at first with all the rules and tags that are available they are a step above aweber and the regular crew of autoresponders. The ability to have people opt in easily by text and send text broadcasts is also a plus. Their 2 hour implementation call is really great where they will literally set everything up and test it for you live via screen share before you kick off. The pricing is expensive? Is there any other alternative? Dody, Take a look at Infusionsoft as alternative to Ontraport. I have used both Infusionsoft and Ontraport; and I have got to say that Infusionsoft is miles ahead in terms of functionality and usability. I use Ontraport daily and it is so much more than CRM and Autoresponder. One of the main reasons people get confused with it and leave it is because they don’t really understand that it’s a business automation system. Its features include coupon codes, marketing tracking, affiliate management, membership websites, etc. And when you combine the cost of all the additional services you’d need to manage all that, it starts making sence. Last year I published a review on Ontraport and I know how good they really are. Being a leading small business CRM, they are my #1 choice so far. Good to see another comprehensive review here, which will help others to know more about them. Ontraport sounds exiting, the combination of email marketing and CRM is definitely needed and can help small businesses.